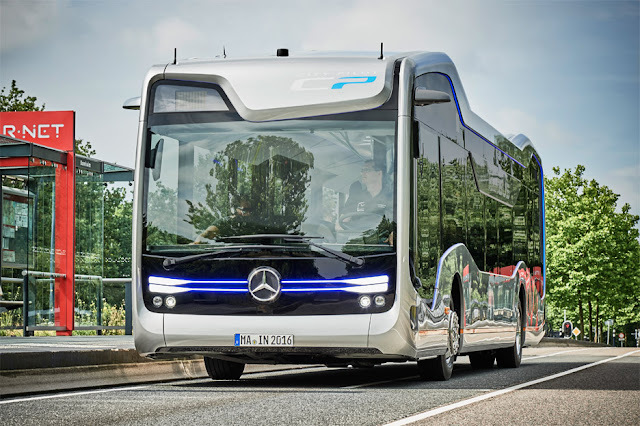 The Mercedes Future Bus is based on the firm's 12-m (39-ft) long Citaro bus model and is powered by a 220-kW (299-hp) Mercedes-Benz OM 936 in-line six-cylinder engine. The CityPilot component is a technology platform that is layered on to the vehicle, affording it automated lane-keeping, longitudinal guidance, acceleration and braking functionalities. It builds upon the technology used by Mercedes' autonomous Actros truck. Combining connectivity, camera and radar systems and is described by Mercedes as "a milestone on the way to the autonomous city bus." The interior design of the bus is open-plan and is said to have been inspired by city squares and parks. There are three different zones that accommodate passengers based on how long they will be on the bus, with upwards-branching grab rails and ceiling lights that, the company says, resemble a leaf canopy. While that might all be very pleasant, the bus itself doesn't seem like it will accommodate all that many passengers, as the company has chosen an open and airy layout over one that maximizes seating space. Passengers board and alight via two sets of double-width doors halfway along the body of the bus. Green luminescent bands indicate which set of doors should be used when entering or leaving and red bands indicate which shouldn't be used. This, along with the position of the doors and an electronic ticket system, is employed to speed up passenger flow. A newly designed and simplified cockpit is part of the main compartment, rather than being separated. Information is presented to drivers on a large display and they, in turn, are able to relay information and entertainment to passengers via monitors. The bus has a top speed of 70 km/h (43 mph) and the driver does not need to accelerate, brake or steer. He needs only control the bus to the extent that traffic regulations require, but can take control in the event that he needs to. In fact, CityPilot is said to improve safety by way of eliminating human error, as well as to improve efficiency and comfort through smoother driving. The system employs 10 cameras to scan the road and the vehicle's surroundings. Four short-range radar sensors monitor distances from 50 cm (20 in) to 10 m (33 ft) ahead of the bus and two stereo cameras with a range of up to 50 m (164 ft) provide 3D vision and obstacle recognition. The route ahead is monitored by long- and short-range radar systems, while GPS, lane-tracking cameras and four cameras for global visual location are all used to determine the position of the bus within its surroundings. An additional two cameras look downwards so as to "read" the road surface and three others record aspects of the journey such as the movements of the bus and the actions of the driver. The data from all these sources is brought together by a process known as data fusion, which creates a precise picture of the bus' situation and environment, allowing it to be maneuvered to within centimeters of objects such as curbs, according to Mercedes. The bus is able to recognize traffic lights and used them to safely negotiate junctions, recognize obstacles — including pedestrians — brake autonomously as required, and to stop and open its doors at bus stops automatically. The Future Bus with CityPilot was recently demonstrated on the Airport Line 300 Bus Rapid Transit (BRT) route between Amsterdam-Schiphol airport and Haarlem in the Netherlands.